This week: A skill drill that includes a conditioning element. The drill starts with X1 and X2 sprinting to the far blueline and stopping, then sprinting the other way. Coach passes to X1, who drives and shoots far pad. X2 crashes for a rebound. After the rebound play, a coach passes the puck to X2 who has popped into soft spot for a catch and shoot. Coach then leaves a puck behind the net for X1 to pick up, cut back and then wrap to the far side. After the wrap, both X’s sprint back to lines. 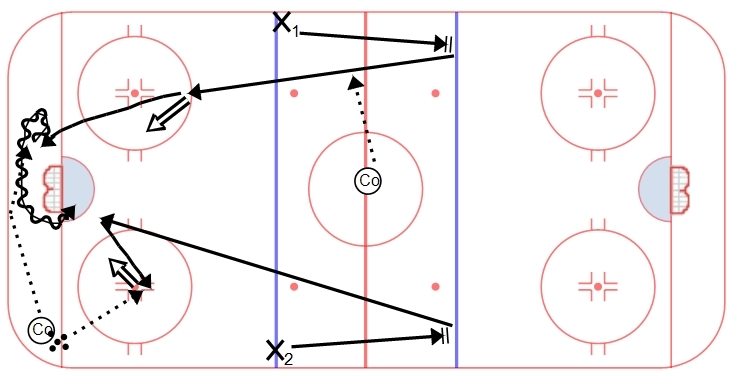 This drill involves a number of skills and skating agility pieces and also adds some conditioning for your team. A fun way to get some skill and skating work in at the end of practice. Also good for the goalies, as they have an opportunity to play a far pad rebound, a catch and shoot in the slot and then a wraparound.